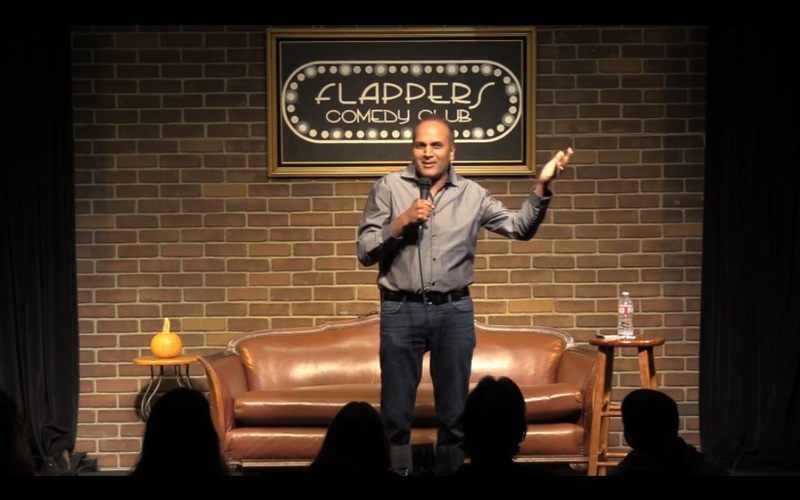 The jokes out of the Indian American’s mouth are clean, a fact he proudly tells audience members set his brand of comedy apart. The audience is packed with a desi crowd, everyone settled into their seats at Flapper’s Comedy Club. One look around tells you it’s family crowd full of Indian aunties, uncles, children, youth, and the odd mix of people who have come for a laugh. Raajeev Aggerwhil, takes the stage, an Indian man with a big smile and who reminds the crowd of a hip desi uncle which immediately resonates with his audience. Chuckles and laughter come from the crowd. When Aggerwhil’s set is finished his two sons Neil and Vicktor and wife Serykah subsequently take the stage while eldest son Raeshib claps and show his support from the audience. Each member of the Aggerwhil family deliver family friendly jokes that weave cultural nuances and clean humor together. As the show ends, the family enters the crowd to thank all audience-goers for their attendance. Indian standup comics, let alone an entire family of comics or those involved in the entertainment industry is rare in Hollywood. Aggerwhil, a New Delhi native says he is a techie, actor, and stand-up comedian. His material for shows comes from stories of his upbringing, pre-arranged marriage, and struggle between being frugal and wanting a luxurious lifestyle. The next time you’re in Los Angeles, stop by Flappers Comedy Club, or look for the comedian on television.